This article was published in the Annals of the Carnegie Museum in 1909. 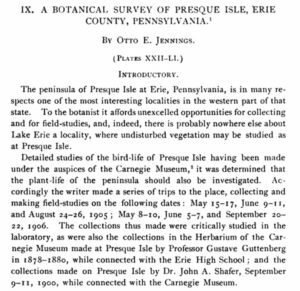 The survey of Presque Isle was led by Otto Jennings, a prominent botanist for whom the Jennings Environmental Education Center was named. The survey was performed about 100 years after it was used a naval base during the War of 1812, and about 12 years before it became a state park. This is an important baseline study as there are no non-native plants identified in the plant list at the end of article. A recent visit by ArcheWild staff to Presque isle found that the bayside shoreline and the edges along the walking paths have become infested with non-native species, particularly honeysuckle, rose, and knotweed. Although few of what would have been common species could be found, the major plant community types seem to remain largely intact. Click on the article image below to go to the page with the link to download the PDF file. Registration is required. See some other fun images from Presque Isle below.